Heat oven to 400ºF. Line baking sheet with aluminum foil. 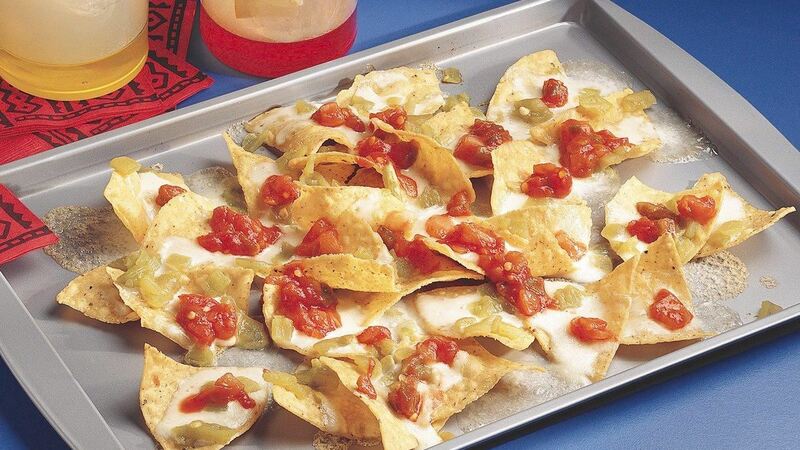 Place tortilla chips on baking sheet. Sprinkle with cheese and chilies. Bake about 4 minutes or until cheese is melted. Top with salsa. Serve hot. Special Touch: Red or blue tortilla chips, often available in the organic section of your local market, add a colorful twist to this recipe. Time Saver: To microwave each serving, arrange 7 tortilla chips in a circle on a microwavable paper plate. Sprinkle 1/4 cup of the cheese over chips. Sprinkle with 1 tablespoon green chilies. Microwave uncovered on High 20 to 30 seconds or until cheese is melted. Top with 1 tablespoon salsa.